The rain hasn’t put a damper on I-GO & CNT’s Bike to Work Week efforts. We were champs in our small biz category last year in this citywide challenge promoted by our pals at the Active Transportation Alliance (formerly the Chicagoland Bicycle Federation). 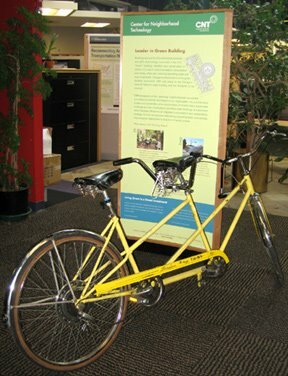 New this year: We’ve got a tandem “taxi bike” in our office atrium to shuttle employees who don’t have bikes of their own. Tomorrow, we’ll be at the culminating rally in Daley Plaza. Pedal on over and give us a honk. 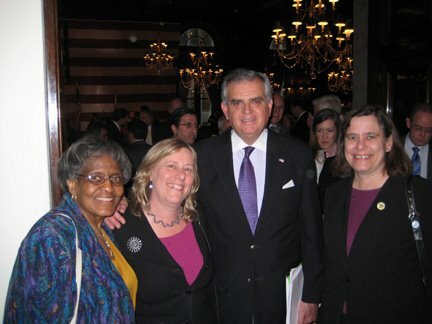 Above, from left to right: CNT Vice President of Policy Jacky Grimshaw, I-GO Car Sharing CEO Sharon Feigon, U.S. Secretary of Transportation Ray LaHood, and CNT CEO Kathryn Tholin at the Union League Club in Chicago, where LaHood spoke in May. Who knew what to think of Ray LaHood when Obama appointed him? 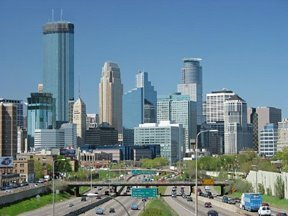 Turns out, writes Kaid Benfield of the Natural Resources Defense Council, the Secretary of Transportation is quite progressive, indeed, and is adopting the integrated sustainability model long advocated by I-GO’s parent org, the Center for Neighborhood Technology—apparent in such current projects as CNT’s Housing & Transportation Affordability Index. LaHood talks about “location efficiency”; so do we. Seems like a Ray of hope to us. You are currently browsing the archives for the center for neighborhood technology category.